To view a set of stocks or ETFs in the Table, select from one of the items in the Navigation panel on the left side of the Stock Rover screen. Click an item to load it, or click the arrow to the left of the category name to expand the item tree below. Clicking a higher-level folder will load the high-level items into the table. For example, clicking ‘Indices’ loads the supported market indices as separate rows in the Table. 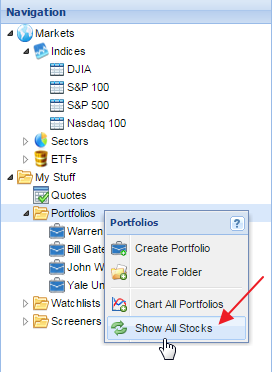 To display all the stocks in a higher-level folder, right-click the folder and select ‘Show All Stocks’ from the drop-down menu. All the stocks on the North American exchanges are organized into sectors and industries (using Morningstar categorizations), which you can explore by browsing the the ‘Sectors’ folder. Our ETFs are categorized as well.